For the homeowner who likes working with wood, building shaker style cabinet doors is a worthy project. 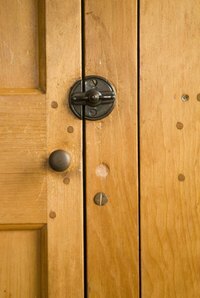 Shaker style doors require the use of a table saw to cut the shaker panels to the correct size–and to make the tongue and grooves in the doorframe pieces. The new shaker style cabinet doors will become a focal point of your kitchen. Install a ¼ inch dado blade in the table saw, according to the manufacturer's instructions. Locate the wheel on the front of the table saw that raises the blade and set the blade at a ¼ inch above the table. Set the fence of the table saw so there is a ¼ inch between the blade and the fence. Stand each 2 inch strip on one of its ¾ inch edges, set it against the fence of the table saw and run the strip through the saw to create a groove in the center of the edge. Do this to only one ¾ inch edge of each strip. Measure the door opening and add 1 inch to the length and width. For example, if the door opening is 15 inches wide and 28 inches tall, the working measurement for the door is 16 x 29 inches. Cut the shaker door side pieces first. Separate the side pieces by length. Vent hood cabinet doors are shorter than other wall cabinet doors. This is also true for microwave cabinets and refrigerator cabinets. Determine the width pieces by first subtracting the side pieces from the overall length of the width pieces. This means for a door that measures 16 inches wide, subtract 4 inches because the side pieces to the door are each 2 inches wide. Before cutting the width pieces, add ½ inch to the length because the width pieces fit inside the groove cut with the dado blade. Cut the pieces with an electric miter saw. Clamp a piece of lumber to the inside of the table saw fence with a C-clamp. Turn the table saw on and slowly move the fence toward the blade. When it touches the blade, set the fence so it won’t move. Set the ends of the width pieces against the fence and run them over the blade. Turn them over and run them again. This produces a "tongue" on the ends of the width pieces to fit inside the grooves of the side pieces. Put the doorframe pieces together without glue. Cut ¼ inch pieces of plywood 7/16 inch larger than the opening in the doorframe (width and length). For the doorframe with an overall measurement of 16 x 29, the doorframe opening becomes 12 x 25 inches. That means the ¼ inch plywood for the shaker panel measures 12-7/16 x 25-7/16 inches. Insert the plywood into the doorframes. Apply wood glue to the tongues of the width pieces before inserting them into the side pieces. Clamp the doors with bar clamps at the top and bottom of the doors. Clean up excess glue immediately with a damp cloth. Cutting the &frac14; inch panel 7/16 inch larger than the &frac12; inch provided by the &frac14; inch grooves allows the door room to expand and contract due to moisture in the air. Do not apply a finish to the doors without proper ventilation.